Introduction to Spell Breaking from Women's Mysteries on Vimeo. 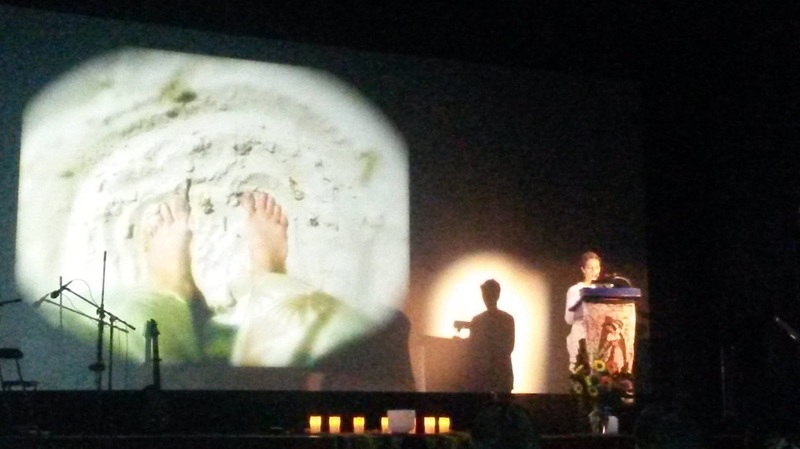 On stage at the historic Rosendale Theatre in Rosendale, NY, music, ritual and marvelous sounds will mingle with haunting passages from Spell Breaking; Remembered Ways of Being; a stirring collection edited by longtime Hudson Valley resident, author and counselor Ione. The Anthology features the fresh voices of twenty members of an international Women's Mysteries community. Excerpts from Spell Breaking will be performed live and will feature vibrant spoken word, music and visuals. World renowned composer Pauline Oliveros will guide the audience in performing Text Scores from her newly published Anthology of Text Scores. Performers and artists represented include: Jo Andres, Anne Bourne, Andrea Goodman, Andrea Israel, Anne Hemenway, Carol Chappell, Donnaldson Brown, IONE, Julia White, Jaclyn Heyen, Julie Winter, Lisa B. Kelley, Lorah Yaccarino, Monique Buzzarté, Pauline Oliveros, Rachel Koenig, Sadee Brathwaite, Sangeeta Laura Biagi, Shirley Parker-Benjamin and Ximena Alarcon. Read more about the performers and artists here. In this journey we experience the potency of Yoruba ritual, the deepest grief of loss, the awakening of creativity and life purpose,the renewal of resolve and the transcendence of life threatening illness. In this very special performance, feelings, dreams and memories emerge illuminating the often harrowing process of "Spell Breaking" that can lead to a special kind of satisfaction, the remembering of deep and essential "ways of being". This performance is a benefit toward creation of a permanent M.o.M. Sanctuary for Healing and Research, an International women's exchange program and scholarships for courses of study for the financially challenged. Women's Mysteries; For Women who want to go Deeper is a program of the Ministry of Maåt, Inc. The 39 active members of this Kingston based Women's Mysteries community are currently spread throughout the world, encompassing the US, France, Italy, Egypt and Canada. Studies include the intuitive arts, women's history, ancestral studies and meditative forms including dance and Qi Gong. There is strong support for all the creative arts, including writing, all the visual arts and movement. "We are transforming worlds- one woman at a time! " Spell Breaking; The Traveling Show has been performed over the past year with alternating members of the collective in NYC, Brooklyn, Kingston, NY, Olive, NY, Prague, CZ, and Paris. 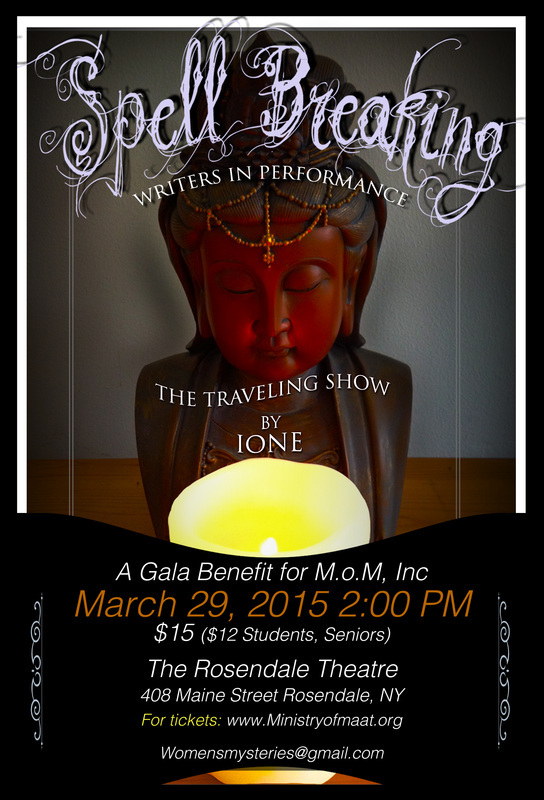 Spell Breaking will be performed live as a multi media event at The Rosendale Theatre on March 29, 2015. "Ione’s Spell Breaking; Remembered Ways of Being is exactly that!! Ione is a “spell breaker".